Proof is in the Polygons and our polygons have Character! Proof is in the Polygons and our polygons have sharp corners! Proof is in the games and our games are fun! Crafting characters is one of our favorite things to do (hi and lo poly) from iterative concepting, to fully flushed out comical or realistic people and creatures. Monkey Wrench Studio can produce original characters or create from your designs. We provide a full cycle character development, starting from sketch to fully textured and rigged models ready for animation or integration into any game style and game engine. We have spent over ten yrs honing our skills in creating 3D characters for games and animations. Creating hard surface models is second nature (hi and lo poly) from iterative concepting, to fully flushed out comical or realistic people and creatures. 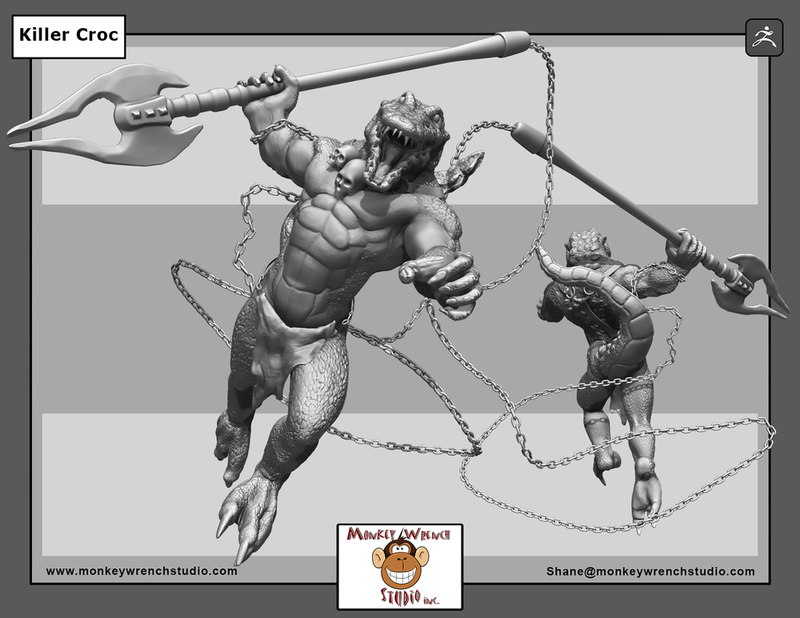 Monkey Wrench Studio can produce original models or create from your designs. We provide a full cycle model development, starting from sketch to fully textured and rigged models ready for animation or integration into any game style and game engine. We have spent over ten yrs honing our skills in creating hard surface models for games and animations. Monkey Wrench Studio Inc. artist are also classically trained and can create a wide variety of styles for concepts and illustrations. We can create concepts with hand drawings to digitally painted images. Concepting in 3D has never been easier and faster with current tools like Zbrush. Let us help you concept your next set of characters or your entire game! Monkey Wrench Studio is a 3D visualization, animation and design studio. We provide a wide range of services to a substantial and diversified client base that includes video game companies, post houses,video production companies, architectural firms, industrial industry and many more. We are your one stop shop to help you create solutions for your projects. Website and All images Copyright 2019 Monkey Wrench Studio Inc.